Le premier film d’action 100% Nouchi. En direct des ghettos d’Abidjan. Tony, un jeune vendeur de cigarettes à la rue Princesse, fait tout pour s’en sortir. Mais, progressivement, il va basculer dans le ghetto de la délinquance. Il va devoir affronter son grand frère, Mike, qui a choisi un autre chemin en devenant policier. Deux frères que tout oppose se livrent à une course poursuite tragique sans savoir à qui ils ont affaire. Quelques morceaux d’anthologie, dont un meurtre tourné en plan séquence, à moitié improvisé dans la demi-pénombre d’une épicerie éclairée d’une ampoule glauque, ou encore les interludes narratifs scandés par le plus célèbre rapper du quartier. Film entièrement en Nouchi, l’argot de la jeunesse abidjanaise. Interprètes : Abdoul Karim KONATÉ, Adelaïde OUATTARA, Mamadou DIOMANDÉ, Mohamed BAMBA, Jean-Charlie RABET dit Moyo Maya, Christine BRITTO, Franck LAHOU, Ahmed KONÉ et Henri Joël N’gnaga. 2012 | TIFF – Festival International du Film de Toronto, Canada. A fast paced action live from Abidjan’s ghettos – the first Ivorian action in Nochi, about two brothers living their lives on opposite sides of the law. Two brothers from the ghetto who are growing up with all odds against them, undertake a dramatic and eventful quest without understanding with whom they are dealing. A low budget half-scripted, half-improvised action movie shot in just three weeks in the poorest neighbourhoods of Abidjan for a budget of only 10,000 USD. Entirely in Nochi, the slang of the marginalized youth, The Hood is Burning, is a story about the hardships of the ghetto – accompanied by the rhymes of the best rapper in Wassakara, Yopougon, Abidjan. A raw, noir-tinged urban legend set to the cadence of slam poetry and the beat of street dance, Burn It Up Djassa is intended to serve as the herald of an exciting new artistic movement on the Ivory Coast – one that will « bring back cinema to the street, to the real speak of folk… in the spirit of Italian neorealism or the French New Wave, – in the words of the film’s director, Lonesome Solo. 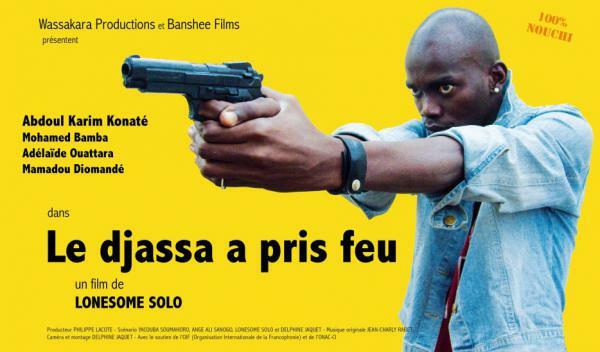 Filmed in the Abidjan neighbourhood of Wassakara, only a few months before the Ivorian civil war broke out, Burn It Up Djassa was a labour of love for a collective of actors, writers and technicians, all of whom come from Wassakara and who have created an engrossing, vérité-style fiction at the very edge of their own lived experience. After his father died, Tony (Abdoul Karim Konaté) was pulled out of school by his mother; and when she passed away, he made his way by selling cigarettes on Princess Street, famous in Abidjan for its bars, dance clubs and exciting nightlife. Now twenty-five-years old, Tony is bitterly convinced that his future has been sacrificed, and is desperate for a way out of the ghetto. His older brother Mike (Mamadou Diomandé) has been considerably luckier, having found a job on the police force, while Ange (Adélaïde Ouattara), their younger sister, is also pursuing respectability by learning to become a hairdresser – but she secretly moonlights as a prostitute in order make ends meet. Looking for easy money, Tony eventually turns to gambling and is dragged further down into the seedy underworld of Wassakara – until he commits a shocking crime that irrevocably changes his life. Now an outlaw, he goes on the run and is relentlessly pursued by the police, his own brother among them. Narrated by a storyteller (Mohamed Bamba) in the Abidjan argot called Nouchi, this compelling crime drama bursts with the eagerness of a generation determined to shape its own destiny and reflect its present in its own distinctive language, music and dance. Burn It Up Djassa‘s raw energy has remarkable staying power and, in spite of the dark tenor of the story, it brims with hope. Dopo la morte del padre, Tony è stato costretto dalla madre a lasciar la scuola e, quando anche lei è morta, ha cominciato a farsi la sua strada vendendo sigaretta sulla Princess Street, via di Abidjan famosa per i bar, le discoteche e i locali notturni. A venticinque anni, Tony è amaramente convinto di non avere speranze per il futuro ed è alla ricerca di una via di uscita dal ghetto. Suo fratello Mike, invece, è stato più fortunato e ha trovato lavoro in polizia mentre la sorella minore Ange di giorno sta imparando a far la parrucchiera e di sera in gran segreto si prostituisce per arrotondare il bilancio familiare. Alla ricerca di soldi facili, Tony si lascia coinvolgere dal mondo del gioco d’azzardo e viene trascinato negli squallidi bassifondi di Wassakara, fino a quando commette un crimine scioccante che gli cambia per sempre la vita. Divenuto un fuorilegge, si ritrova in fuga dai poliziotti che lo cercano, tra cui anche suo fratello.